St Patrick’s Parish in Dundalk has been granted “independence” from Armagh after nearly a century and a half. At a ceremony last Saturday, Archbishop Eamon Martin appointed Fr Mark O’Hagan as the first parish priest of St Patrick’s in 149 years. Although Armagh is more than 50km away and north of the border, Dundalk has been part of the Parish of Armagh since 1866 when the then-parish priest of Dundalk, Fr Michael Kieran, was elected to the most senior position in the Irish Catholic Church. At that time, work on St Patrick’s Cathedral in Armagh was still underway – construction had started in 1838, but work came to a halt during the Famine, so the building wasn’t dedicated until 1873 and finally completed until 1904 – so Fr Kieran chose to stay where he was in Dundalk. Thus the town became part of the Armagh parish. A precedent had already been set by Archbishop Paul Cullen, who based himself in Drogheda while he was Archbishop of Armagh. Following Archbishop Kieran’s death in 1869, Archbishop Daniel McGettigan chose to base himself in Armagh, partly because the cathedral there was nearing completion, but he decided to keep Dundalk under his episcopal wing and St Patrick’s Church, Dundalk, became a mensal church of St Patrick’s Cathedral, Armagh. 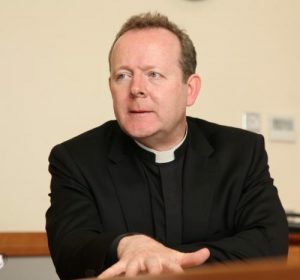 Before he was appointed parish priest at St Patrick’s, Fr O’Hagan had been administrator of the parish for seven years. The ceremony was a joyous occasion, with Archbishop Martin officiating and hundreds of parishioners present. St Patrick’s choir was boosted for the occasion by the choir from the neighbouring parish, St Nicholas’. It was followed by a reception in a marquee erected on the church grounds.